Chocolate. Fried foods. Oily skin. Not washing your face. Unlike some questions that elicit a wide spectrum of answers, if you asked a random sampling of Americans what they felt caused acne; you’d most likely get very similar responses. Chances are the above culprits would come immediately to mind – irrespective of gender, ethnicity or age – simply because we’ve been programmed to think along the same dermatological party line for years. What might surprise many of us, however, is that while some of these more commonly held beliefs may play a part, there are equally significant considerations that lie beneath the surface. Always consult with your dermatologist first but here are some tips. Hormones are your body’s chemical messengers that are vital to optimal organ functionality and overall wellbeing. When out of balance, they can affect mind, body and spirit in a myriad of ways – one of which can be the condition of your complexion. Take milk, for example. Long revered for their high calcium-rich, bone- and teeth-fortifying properties, dairy products might contain progesterone that is a steroid hormone. Not only that, but milk might contain rBGH (recombinant Bovine Growth Hormone), a synthetic growth hormone manufactured by Monsanto. Also known as Posilac, rBGH is administered to cattle by farmers to produce more milk with fewer resources. Sounds good from a financial perspective, but the presence of growth hormone – like substances in our milk can cause increased production of IGF-1, and ultimately keratinization that can lead to acne. Carbohydrates aren’t any better. Some researchers and other experts around the world believe that foods with high glycemic index values like chips, white bread and white potatoes tend to increase blood sugar levels, which can initiate a spike in insulin. This spike could promote sebum production. The more sebum, the greater the propensity for excessive sebum, and dead skin cells to clog pores, as well as create pus-filled cysts. Another tangible example of how an internal state of hormonal imbalance can result in an outward manifestation. 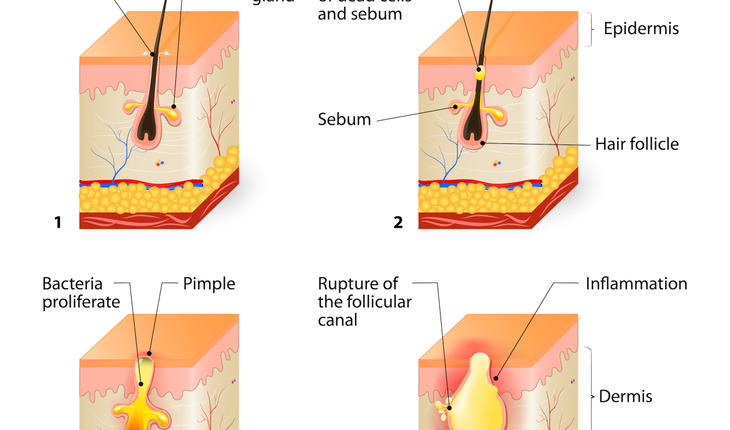 Speaking of what’s happening on the surface of the skin, some doctors have additional thoughts to share on how topical products can actually exacerbate acne-related blemishes, whiteheads, blackheads and pimples. Our skin is physiologically engineered to operate at a slightly acidic natural pH level between 4.5 and 5.5. When high-alkaline soaps and facial cleansers are used as part of a regular skincare regimen, it can throw everything off balance. As the acid mantle of the skin that keeps bacteria out becomes increasingly alkaline, it can no longer stave off breakout-inducing bacteria. Ironic that the products we feel will be good for our skin can actually do it the most harm. Acne is often the result of life out of balance – either by hormone levels being off kilter, consuming too many carbohydrates or dairy products, or inadvertently applying products that aggravate what’s already occurring deep below the surface.